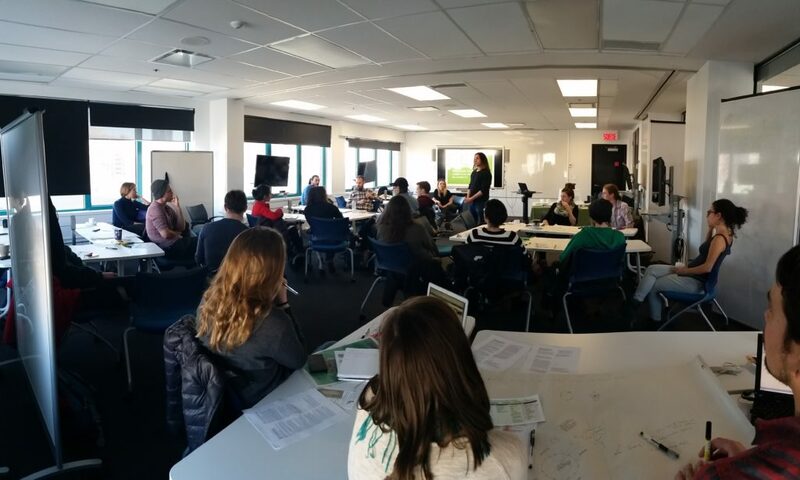 Members of various student-led Concordia food came together on the sixth floor of the Faubourg Building to brainstorm ways to partner up and create a closed loop food system at Concordia on Wednesday afternoon. Taking place in The Centre for Learning and Education, this was the second event taking place to mark the Sustainability Action Fund’s (SAF) 10th anniversary. The SAF hosted the event alongside Sustainable Concordia. A light vegan lunch was provided and the bright room was surrounded by sparkling views of Concordia’s downtown core. The community discussion was facilitated by Erik Chevrier, Concordia PhD student, professor, and the primary researcher from Concordia Food Groups Research Project. The project aims to create an online archive of food groups at Concordia, but also to contribute and promote collaborations and discussion across different projects. Alongside being a key support group for various student-led student food groups at Concordia, the SAF helped fund Chevrier’s project. Wednesday’s discussion started with feedback on the look, feel and content of the Concordia Food Groups website, before moving on to discuss challenges faced by different groups, and the opportunities moving forward to collaborate and make Concordia a closed loop, food sovereign campus. According to Chevrier, Concordia is an exemplary Canadian university when it comes to food initiatives. But he was quick to clarify that “these are coming from the students, not the administration.” Indeed, many of the discussions on Wednesday focused on how to get the administration to champion and support the stellar work of the student food groups. Another key issue addressed by many was the lack of space on campus – space for waste management, for food storage and for processing. Representatives from The Hive, the Hudson Land Trust Project and Concordia Food Coalition were all present, among five or six other food groups.